At the recent AABB Annual Meeting in Boston, a poster presented by the American Red Cross caught the attention of many attendees – including our team. Since our work with blood banks is focused on helping monitor the temperature of blood products during transport and temporary storage, we’re always excited to find solid research by the experts. 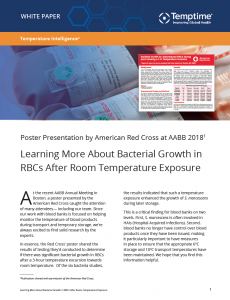 In essence, the Red Cross’ poster shared the results of testing they’d conducted to determine if there was significant bacterial growth in RBCs after a 3-hour temperature excursion towards room temperature. Of the six bacteria studies, the results indicated that such a temperature exposure enhanced the growth of S. marcescens during later storage. This is a critical finding for blood banks on two levels. First, S. marcescens is often involved in HAIs (Hospital Acquired Infections). Second, blood banks no longer have control over blood products once they have been issued, making it particularly important to have measures in place to ensure that the appropriate 6oC storage and 10oC transport temperatures have been maintained. We hope that you find this information helpful. It is not uncommon that power interruptions occur at blood centers and hospitals during extreme weather events. When backup generators fail, refrigerated blood warms beyond 6˚C. 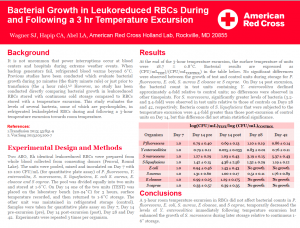 This study evaluates the levels of several bacteria in refrigerated leukodepleted RBCs during and following a 3- hour temperature excursion towards room temperature. Two ABO, Rh identical leukoreduced RBCs were prepared from whole blood collected from consenting donors (Fenwal, Round Lake). The units were pooled, mixed and inoculated on Day 7 with 10-100 CFU/mL (for quantitative plate assay) of P. fluorescens, Y. enterocolita, S. marcescens, S. liquefaciens, E. coli and S. aureus. The pool was divided equally into two units and stored at 1-6˚C. On Day 14 one of the two units (TEST) was placed on the laboratory bench (20-24˚C) for 3 hours, surface temperature recorded, and then returned to 1-6˚C storage. The other unit was maintained in refrigerated storage (control). Samples were taken for quantitative plate assay on Day 7, Day 14 pre-excursion (pre), Day 14 post-excursion (post), Day 28 and Day 42. Experiments were repeated 3 times per organism. At the end of the 3-hour temperature excursion, the surface temperature of units were 18.7 ± 0.8˚C. Bacterial results are expressed as (CFU/mLTEST)/(CFU/mLCONTROL) in the table below. No significant differences were observed between the growth of test and control units during storage for P. fluorescens, E. coli and S. aureus. On Day 14 post excursion, the bacterial count in test units containing Y. enterocolitca declined approximately 4-fold relative to control units; no differences were observed in other timepoints. For S. marcescens, significantly greater levels of bacteria (3.2- and 5.4-fold) were observed in test units relative to those of controls on Days 28 and 42, respectively. Bacteria counts of S. liquefaciensthat were subjected to the temperature excursion were 4.4-fold greater than those post-excursion of control units on Day 14, but this difference did not attain statistical significance. A 3-hour room temperature excursion in RBCs did not affect bacterial counts in P. fluorescens, E. coli and S. aureus, temporarily decreased the levels of Y. enterocolitica immediately following temperature excursion but enhanced the growth of S. marcescens during later storage. 1Publication shared with permission of the American Red Cross. ©2018 The American National RedCross Holland Lab, Rockville, Maryland, USA. ALL RIGHTS RESERVED.